The head of a polling center in Kathmandu. “it is a great day,” he said. 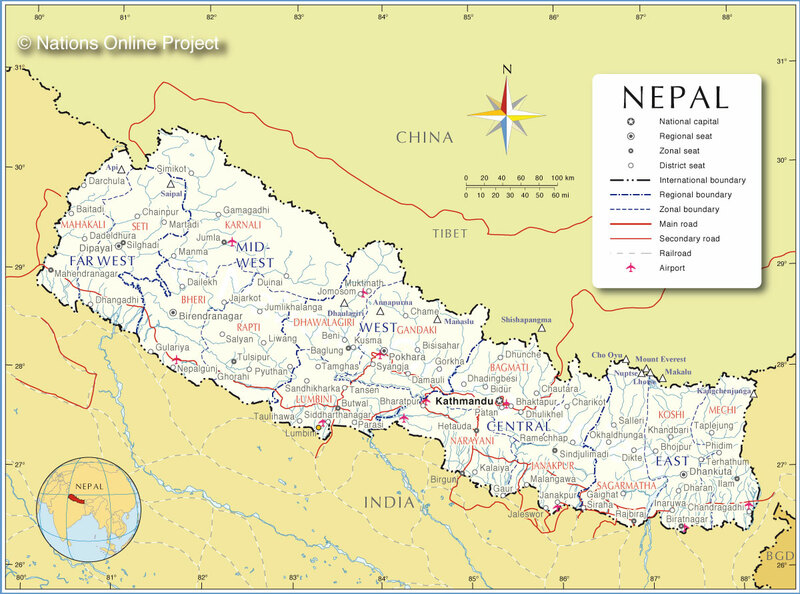 On November 19, 2013, Nepal held its second constituent assembly election since the 2006 peace agreement ended a long-running civil conflict. The first constituent assembly charged with drafting a new constitution could not reach agreement on key issues, including the eventual structure of a federal state. The assembly was dissolved in May 2012 after it went beyond its initial two year mandate and four extensions without finalizing a constitution. The Supreme Court disallowed any further extensions of the mandate. The failure to agree on a new constitutional framework, the dissolution of the constituent assembly, and disagreement about which party would head the government during a new election caused a protracted political and constitutional crisis. Negotiations among the major political parties led to an agreement on an interim government under the leadership of sitting Chief Justice Khil Raj Regmi, and on an election for a second constituent assembly. This agreement was disputed by a group of parties led by a breakaway faction of the main Maoist party which organized an at times violent boycott of the electoral process. 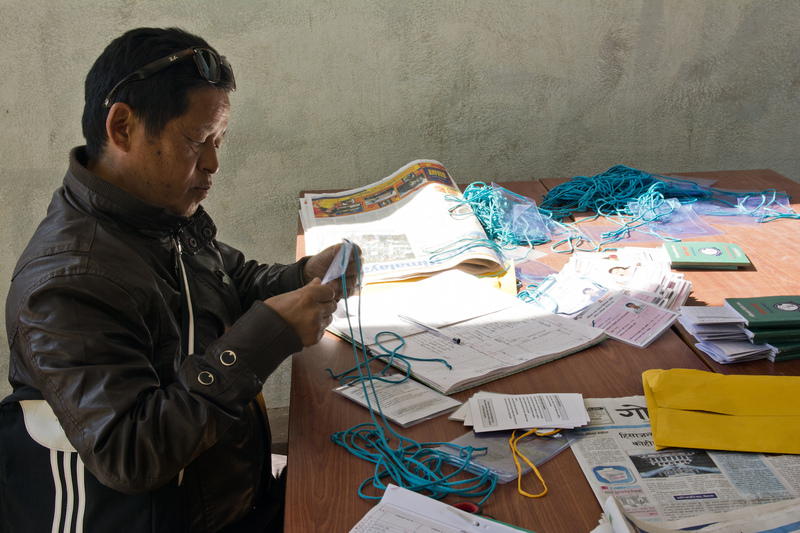 The Carter Center has maintained a team of observers in Nepal since 2007, observing the peace process, the work of the constituent assembly, and key electoral preparations, including voter registration. The ongoing mission transformed into an international election observation mission on Sept. 25, 2013, following an invitation by the Chairman of the Council of Ministers and the Election Commission of Nepal (ECN). 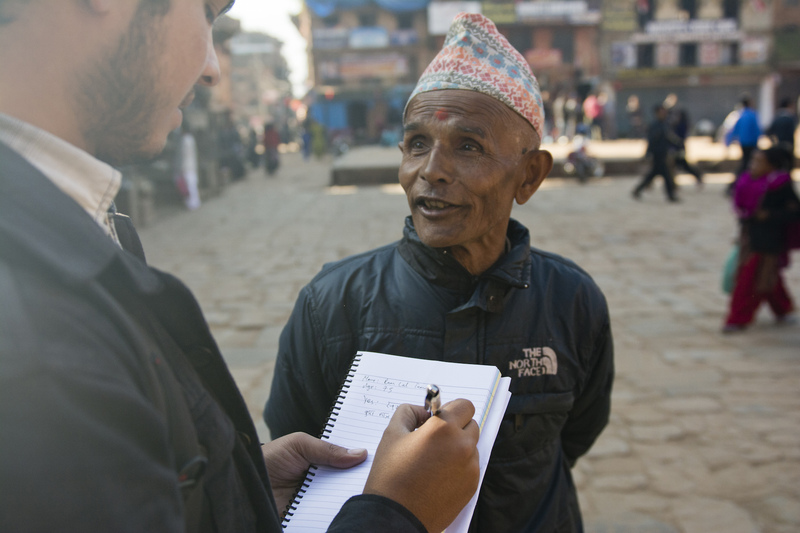 Subsequently, 12 long term observers were deployed in six hub-cities across Nepal. Closer to election day, 54 additional short term observers were deployed to observe voting and counting. In total, Carter Center observers represented 31 nationalities. The mission was led by former U.S. President Jimmy Carter and former Deputy Prime Minister of Thailand Honorable Dr. Surakiart Sathirathai. The Carter Center made its assessments based on Nepal’s legal framework and its obligations for democratic elections contained in regional and international treaties. The Center’s observation mission was conducted in accordance with the Declaration of Principles for International Election Observation. On January 2, 2014 the ECN submitted the official results of the second constituent assembly election to the president. The Nepali Congress (NC) and the Communist Party of Nepal (United Marxist-Leninist) (CPN (UML)) emerged as the two largest parties in the 601-seat constituent assembly, with 196 and 175 seats respectively. They were followed by the Unified Communist Party of Nepal (Maoist) (UCPN (Maoist)), which won 80 seats and lost its position as the largest party in the previous constituent assembly. With 24 seats, Rastriya Prajatantra Party-Nepal (RPP-Nepal) emerged as the fourth largest party in the constituent assembly due to its results in the proportional representation component of the electoral system, as it did not win any seats in the first-past-the-post races. Various Madhes-based parties won a combined 50 seats. In total, 30 parties of the 122 parties that contested the election are represented in the constituent assembly, along with two independent candidates. Thanks to the quota requirements in the proportional representation component of the electoral system, Nepal’s constituent assembly remains the most inclusive legislative body in South Asia, but it is marginally less so than the assembly elected in 2008. Thirty percent of the 575 elected deputies are women. In terms of ethnic and caste diversity, the elected body comprises 7 percent Dalit, 34 percent Janajati, and 18 percent Madhesi representation. The remaining 41 percent belong to the category Khas Aryan and others. On January 21, 2014, the elected members of the constituent assembly were sworn in. At the time of this writing (Feb. 2014), the 26 appointed members remained to be nominated, and by-elections must be held in four constituencies. The following is an excerpt from the final report. The full version can be found in English and नेपालीमा पढ्नुहोस. 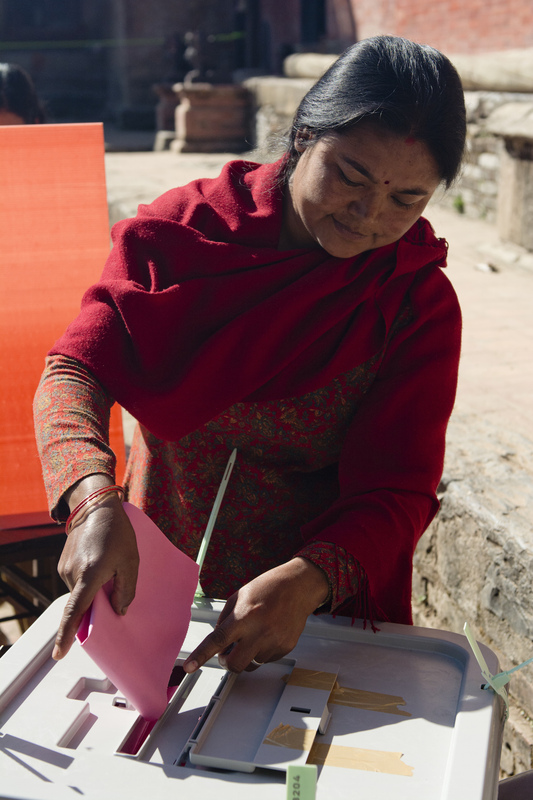 A woman casts her vote in Kirtipur. The November 19, 2013, second constituent assembly election was well-conducted and reflected a serious effort to respect international obligations for genuinely democratic elections. The overall successful conduct of the election was a remarkable achievement in view of the months of political crisis since the dissolution of the constituent assembly and the attempts of some boycotting political parties to derail the electoral process. In spite of these challenges, the electoral process was improved in several important respects as compared to the first constituent assembly election in 2008. Although there were sporadic violent incidents and instances of intimidation during the election period, the process was considerably more peaceful than the 2008 election. For these reasons, Nepalis should be congratulated on an election which furthers the peace process and restores democratic legitimacy. In spite of these achievements, there remain areas in which the electoral process could be improved in the future to ensure that it fully meets Nepal’s international obligations for democratic elections. The second constituent assembly, which has a mandate to finalize the new constitution and define the country’s institutional framework, will have a unique opportunity to reform legislation for future elections. In advance of widely anticipated local elections, the ECN also has an opportunity to build on the success of the 2013 election to address remaining challenges in voter registration, voter education, training of election officials, and other aspects of the electoral process. Consolidate electoral legislation and introduce reforms. The legal framework remained largely the same as in the 2008 election and, overall, sufficiently provided for the conduct of the election. The interim constitution emphasizes broad political participation and is the basis for Nepal’s inclusive constituent assembly membership. However, the interim constitution did not foresee the need for a second constituent assembly election and had to be modified following the dissolution of the first assembly without adopting a new constitution. The adoption of the main electoral law and modification of the interim constitution by presidential order reflected the extraordinary political situation of the country following the dissolution of the assembly. While necessary for the election to take place, this was outside accepted democratic practice in which laws are adopted by elected representatives of the people. There is a need for considerable reform of electoral legislation after the new constitution is adopted. The complexity of the legal framework for elections, with its numerous laws, directives, regulations, and codes of conduct, at times made it difficult for stakeholders to interpret and apply. Although the aspects of the legal framework needing reform will depend in part on the structure of future state institutions, it will be important for reforms to consolidate electoral legislation. Areas to be addressed in the current legal framework include the electoral system, delimitation of constituency boundaries, voter registration eligibility, candidacy rights, observer rights, campaign finance regulation, some election day rules, and provisions regarding the post-election nomination of candidates. The binding code of conduct for election participants contains a number of positive measures, especially in providing for a fair campaign environment and reinforcing the rights of women, but some provisions are overly restrictive in regulating the campaign activities of parties and candidates. Ram Lal Tamrakar, 75, told a Carter Center observer, “Saas Huda samma Aas,” which means “I’m hopeful ’til my last breath.” He believes that those elected to the constituent assembly will finally create Nepal’s constitution. Elect all deputies by popular vote. The electoral system for the constituent assembly employs a mix of first-past-the-post (FPTP), proportional representation (PR), and nomination by the government to ensure representation from each of Nepal’s administrative districts and from its large number of ethnic, linguistic, and other groups. In addition, there are quotas for women, minorities, and disadvantaged groups, thereby broadening participation and making the elected assembly more reflective of Nepal’s diverse population. Some aspects of the current system, however, do not fully correspond to democratic principles. The provision for political parties to select which candidates from the proportional representation lists receive mandates after election day and the provision for the council of ministers to nominate some members of the constituent assembly limit the right of voters to choose their representatives. The electoral system chosen under the new constitution should ensure that voters directly choose all of their representatives in at least one chamber of the legislature. The Carter Center hopes that any new electoral system would protect and extend the advances already made in promoting the participation and representation of women, indigenous groups, minorities, and other groups. Build on success by enhancing transparency. The ECN did a commendable job in planning, preparing, and conducting a credible election despite the political crisis, the boycott by some political parties, and uncertainty as to whether the election would take place at all. The appointment of election commissioners on the basis of consensus and the efforts of the commission to act as an independent body provided the basis for public confidence in the conduct of the election. At the field level, there was a dual system for the organization and conduct of the election, involving election commission staff and judicial officials. Most stakeholders were satisfied with election preparations, although the late distribution of voter ID cards created some concern. However, the election commission’s decision not to allow observation of ballot printing was a missed opportunity to provide full transparency and to increase confidence. The ECN now has a solid foundation to build upon this success prior to the next election in order to include more citizens on the voter register; clarify election rules; improve voter education, outreach, and training of polling and counting officials; make the complaint mechanism more effective; increase the number of female and minority election officials; and enhance the transparency of the commission’s decision-making. Adjust constituency boundaries so as to ensure equality of the vote. The interim constitution provides for the delimitation of the first-past-the-post constituency boundaries so as to ensure that both the distribution of constituencies among Nepal’s administrative districts and the number of voters per constituency reflect the population as determined by the census. Despite the 2011 census, which should have led to adjustments to constituency boundaries, conflicting requirements for delimitation outlined in the interim constitution meant that there was little the Constituency Delimitation Commission could do in terms of reassigning constituencies among districts – ultimately leaving the Tarai region slightly underrepresented. The commission did not take steps to adjust constituency boundaries within districts. This meant that a few constituencies had a considerably higher population than neighboring constituencies within the same district, affecting the equality of the vote. Well in advance of the next elections, constituency boundaries should be adjusted, based on data from the 2011 census, to ensure that constituency populations are as equal as possible. Audit the voter register and expand registration to include all adult citizens. 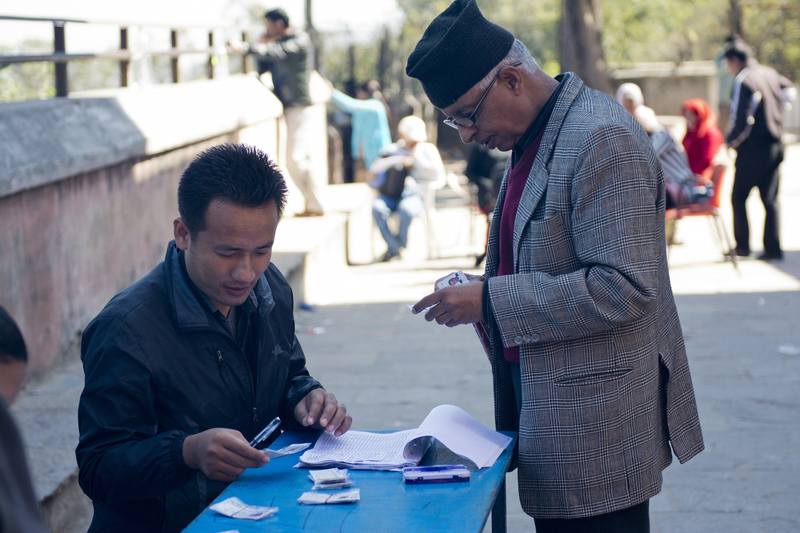 A man picks up his voter ID card at his polling station the day before election day in Kirtipur. The voter registration program took important steps towards meeting Nepal’s international obligations to ensure universal and equal suffrage. To address some of the problems identified in the 2008 election, when the voter lists were a major source of controversy, the ECN created a new biometric voter register. Voter eligibility criteria were consistently applied in building the new register. As a result, stakeholders had confidence that those on the voter lists were eligible to vote and that voters could be properly identified on election day. This confidence was reinforced by providing public access to the voter lists. Several issues, however, remain to be addressed before voter registration can be said to fully meet international obligations. The number of voters on the register is considerably lower than the number the ECN initially expected to register and even lower compared to the potential number of eligible voters suggested by the 2011 census. No audit of the new voter register, which would identify the reasons for this difference, has been conducted yet. Eligibility requirements make it difficult for some married women, disadvantaged people, and others without documents to prove citizenship. Citizens residing temporarily outside Nepal are unable to register, and citizens who have migrated within the country often find it difficult to be on the voter list of the constituency where they actually live. The Carter Center recommends that the government, the constituent assembly, and the election commission take the steps necessary to provide for a fully inclusive voter register. These include conducting an audit of the voter register, steps to expand voter registration to include all adult citizens, and proactive measures to ensure that all citizens, especially married women and persons lacking proof of citizenship, have access to documents needed for voter registration. Tailor voter education messages to target audiences, including more effective use of minority languages. The election commission undertook extensive voter education efforts involving the use of mass media at the national and local levels, as well as approximately 15,000 voter education volunteers. These efforts were hampered to some extent by the holidays that took place during the election period, but they were also limited in many locations by materials not being published or available in local languages. Voters appeared to be aware of the requirement that they would need a photo ID in order to vote. However, the percentage of invalid ballots remained relatively high, decreasing only marginally from 2008. This indicates that a considerable number of voters remained unaware of basic procedures related to voting, limiting their ability to express their choice of representatives in the constituent assembly. Specific voter education efforts targeting minority groups such as Dalits, Janajatis, and women suffered from the short timeframe in which voter education was conducted, and delays in the distribution of materials to the field. For future elections, voter education volunteers should receive training further in advance and have specific targets for outreach. The ECN should also ensure a more effective use of local languages in voter education materials. Remove unnecessary restrictions from candidacy requirements, establish a mechanism to enforce quota provisions, and finalize lists of candidates in a timely manner. The registration of parties and candidates was inclusive and gave the voters a wide range of choice. The process generally met Nepal’s obligations to ensure the right of citizens to stand for election, although the prohibition of candidacy for anyone who is employed by the State (except elected and appointed positions) could be considered unnecessarily restrictive. The final deadline for publication of proportional representation candidate lists was very close to election day, giving voters little time to familiarize themselves with the candidates. Parties complied with the 50 percent quota requirement for women on the proportional representation candidate lists, but only 10.8 percent of first-past-the-post candidates were women. Not all parties complied with the legal requirement that women comprise at least 33 percent of each party’s total number of candidates. In order for Nepal to comply fully with its international obligations in regards to the right to be elected and the right of citizens to choose their representatives, The Carter Center recommends setting the deadline for finalization of the proportional representation candidate lists earlier in the process, establishing a mechanism for consistently enforcing quota provisions, and reducing the scope of restrictions on the right to be elected to those positions which present a clear conflict of interest with candidacy. A Nepali man prepares flags for a political rally in Kathmandu. The flags were held up by motorcyclists as they wound through Kathmandu’s narrow streets. Impose penalties for serious violations of the code of conduct, including violence and vote-buying. Strengthen campaign finance regulation. The campaign environment improved noticeably compared to the 2008 election. For the most part, candidates and parties could reach out to potential voters and freely convey their messages during the campaign period, despite occasional clashes among competing political parties and obstructive tactics used by some of the boycotting parties. Campaigning was initially low key, reflecting doubts as to whether the election would take place. As campaigning intensified closer to election day, there was an increase in the number of violent incidents among competing parties and instances of vote-buying, as well as lesser violations of the code of conduct, which generally went unpunished. There were only minimal legal requirements regarding campaign financing, and a number of candidates appeared to ignore maximum spending limits. The electronic and print media gave broad coverage of the election. While The Carter Center mission did not conduct systematic media monitoring, field observation indicated that the media were generally able to work in a free environment, allowing voters to have access to competing points of view. In order to safeguard the large set of international obligations that support the political rights of Nepal’s citizens as they relate to candidates and political campaigns, more stringent campaign finance regulation and prevention of vote-buying should be priority areas for reform ahead of the next election. In addition, the ECN’s monitoring mechanisms in general should be reviewed to ensure penalties are imposed for serious violations of the code of conduct, including violence. Strengthen training of security forces on legal and constitutional roles and responsibilities. Instances of violence were greatly decreased in comparison with the 2008 election. Nevertheless, there were serious incidents resulting in injury, and even death in a few cases. In addition to occasional violent disputes among supporters of competing parties, boycotting parties increasingly resorted to violence and scare tactics in the run-up to the election. Several buses and other vehicles were firebombed as some boycotting parties attempted to enforce a 10-day transportation strike. With many migrant citizens returning to their home districts in order to vote, such incidents were intended to instill fear and decrease voter turnout. An intensive deployment of security forces in response to threats by boycotting parties appeared to reduce considerably their ability to disrupt the election. The Carter Center recommends to build on these successes and to strengthen the training of security forces on their legal and constitutional roles and responsibilities during the entire electoral process. Define the rights of citizen observers in legislation; Ease criteria required to qualify. 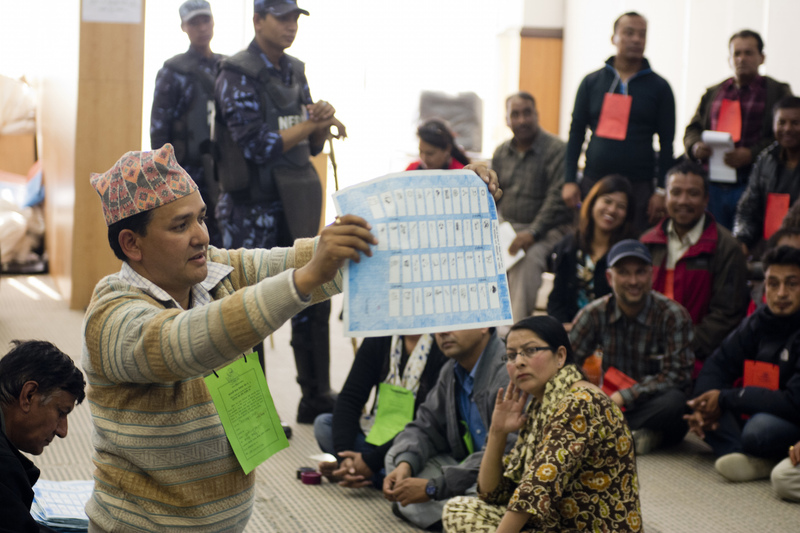 At the National Election Observation Committee, a domestic election observation organization based in Kathmandu, a worker hands out observer credentials. In addition to international observation, there were a large number of observers deployed by civil society organizations prior to, during, and after election day. These citizen observers were able to observe most aspects of the process, and their efforts made a positive contribution towards enhancing transparency and building public confidence in the integrity of the election. However, the legislation does not clearly define the rights of observers, and there were instances in which election officials denied them access. Election observers, especially citizen domestic observers, but also international observers, should be assured access to all parts of the electoral process, including meetings of election officials at national and local levels, printing of ballots, voting, and counting. The ECN’s rules were overly restrictive regarding nomination of observers, although one of the most restrictive rules was repealed after a lawsuit was filed by a citizen observer group. The Carter Center recommends that the rights of observers be defined in the election legislation and that the criteria for being a citizen observer be eased, to be in line with qualifications for being a voter. Address ballot issues and emphasize secrecy of the vote in training. For the most part, Nepal met its international obligations with respect to ensuring the integrity of the voting and counting process. The Carter Center observers had a positive assessment of the conduct of voting in some 90 percent of the polling centers visited, noting an overall peaceful environment free from intimidation or coercion, the uniform practice of checking voter identity, the impartiality of polling staff, and the presence of necessary materials. The new voter lists contributed to the generally smooth conduct of voting, and transparency was ensured in most locations by the presence of party and candidate agents and citizen observers. According to the ECN, voter turnout nationwide was 78.34 percent. However, there were problems observed in some polling centers with ensuring secrecy of the vote and adhering to other procedures, in particular the inking of voters’ thumbs as a measure against potential multiple voting. In a few constituencies, there were indications of “booth capture”, a term used to refer to instances of supporters of one party/candidate taking over the process in order to influence the vote. There were also reports of scattered security incidents, including bomb attacks and intimidation of voters, connected to attempts of boycotting parties to disrupt the election, as well as isolated clashes among supporters of competing candidates and parties. In order to strengthen polling procedures in future elections, The Carter Center recommends that ECN rules provide for spoiled ballots and checking for indelible ink, that polling officers receive increased training on ensuring secrecy of the vote, and that ballots contain the names of parties and candidates in addition to the respective symbols. Ensure that counting is conducted uniformly across the country. 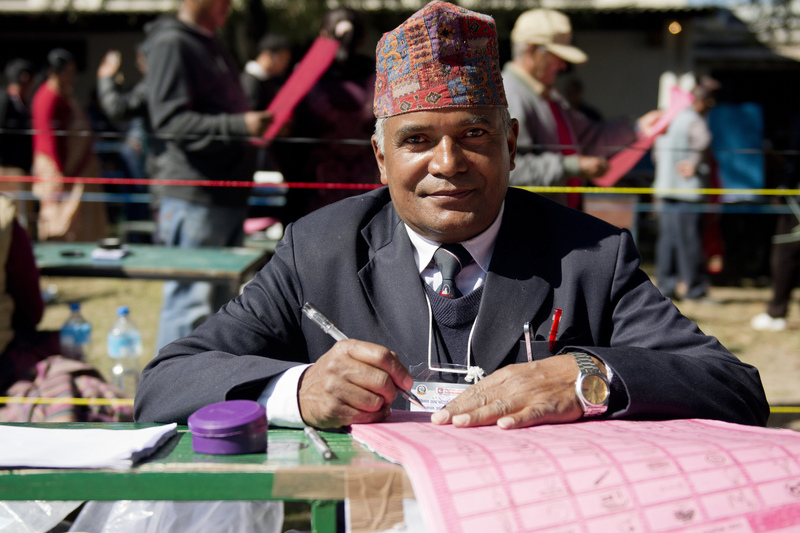 An election official shows a marked ballot to party representatives during the counting in Kathmandu. At the close of voting, the unopened ballot boxes from all polling centers in each constituency were transported to a counting center. The counting process began slowly and lasted for several days in most constituencies. The integrity of the counting process appeared to be generally maintained at the counting centers observed, although procedures were not uniformly followed. There was a relatively high rate of invalid ballots, especially for first-past-the-post ballots. A few parties, including UPCN (Maoist), pulled their observers and agents out of counting centers after counting began, alleging wide-scale fraud during the transport of ballot boxes to counting centers. After an agreement was reached to investigate their claims, these parties dropped their threats of not participating in the new constituent assembly. In order to further increase public confidence in the integrity of the counting process, the transport of ballot boxes to counting centers should be done in such a way as to ensure maximum transparency. Ballot boxes should not be stored at intermediate locations. Moreover, all procedures for counting and tabulation of votes should be established well in advance. To ensure that the counting process is understood by all participants, returning officers could also organize briefings in advance of election day for candidates, party agents and citizen observers. Clarify roles and responsibilities regarding complaints and ensure effective remedies. Prior to election day, relatively few written complaints were filed at the constituency level, with most complaints being made verbally and addressed informally. The ECN found violations in some cases but issued warnings rather than fines. Some regional parties expressed a lack of confidence in the complaints system, alleging that the ECN and local election officials were reluctant to take action against the larger parties. The ECN appeared to deal with complaints regarding candidate registration more rigorously. Following election day, the ECN did not investigate complaints alleging irregularities during the voting process, but limited itself to asking the relevant local election officials if they could corroborate the allegations. The ECN did not provide written decisions in these cases. The ECN has overlapping jurisdiction with the Constituent Assembly Court, a special constitutional body. Some 22 cases were filed with this court, but at the time of writing no final decisions had been reached. The resolution of these cases, which is without a deadline and extends well past the inauguration of the constituent assembly, could undermine the right to effective remedy. To ensure that parties, candidates, and voters know where to submit complaints and that all complaints are dealt with transparently, The Carter Center recommends that the roles and responsibilities of election officials in handling complaints be clarified and that information on complaints received and how they are dealt with be made publicly available. The electoral legislation should be reviewed to ensure that complaints regarding the voting and counting processes are resolved rapidly in order to ensure effective and timely remedy. Consideration should be given to ensuring parity of women and men in all elected councils. The legal minimum representation quotas for women, ethnic minorities, and other groups are positive steps towards promoting inclusiveness of political representation, partially fulfilling Nepal’s international obligation to ensure the ability of all citizens to participate in public affairs. Nevertheless, the decline since 2008 in the representation of women and members of marginalized groups among both candidates and winners in the FPTP races underlines the continuing need for temporary special measures, as well as a democratization of internal party structures in order to achieve the goal of social inclusion. Pro-active measures should be taken to strengthen the participation of women, Dalits, and members of other marginalized groups in decision-making processes within political parties. The drafting of the new constitution is an opportunity to further develop inclusion policies, and consideration should be given to ensuring parity of women and men in elected councils at all levels. 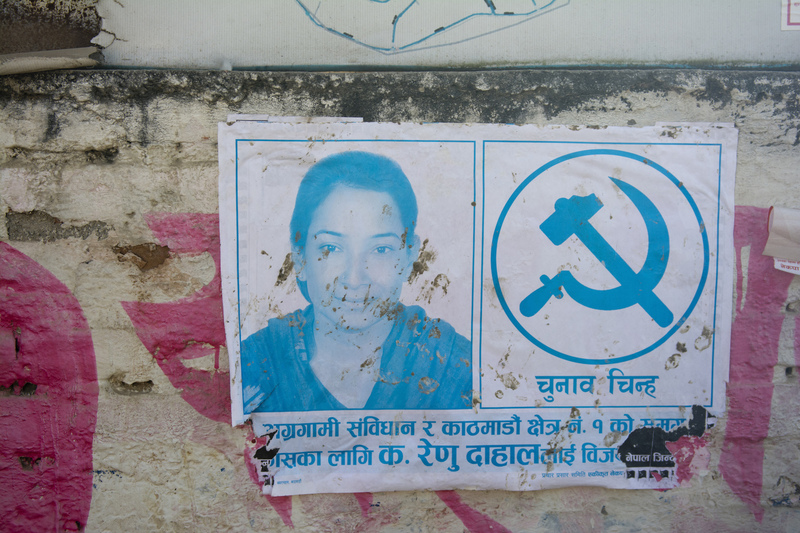 A poster of a woman running for office hangs on a street in Kathmandu. Photos by Deborah Hakes/The Carter Center.